Goldwater's Pow Wow Salsa Pack is a trio of your favorites from our friends in Arizona. You decide which three tasty Goldwater's salsas you would like in this great gift box. 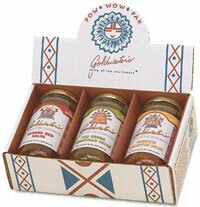 Each Goldwater's salsa is different in their own way and the Pow Wow Salsa Pack is a great way to find your favorite.